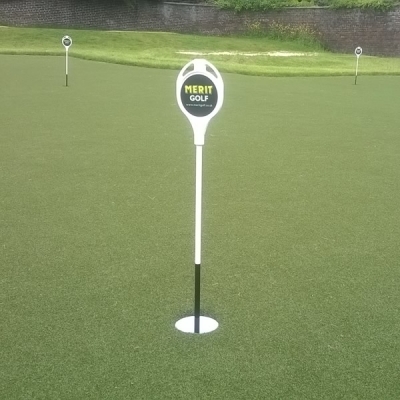 Merit Golf has developed a new Portable Putting Green (Registered Design). 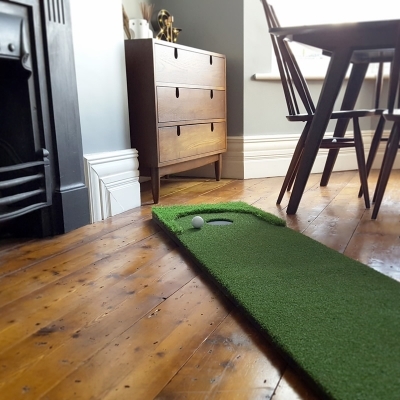 The product can be used both indoors or outside to practise your putting stroke at all times of the year. 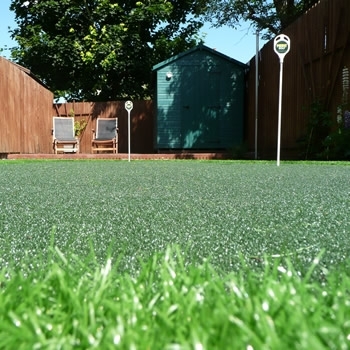 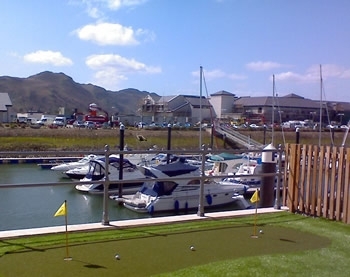 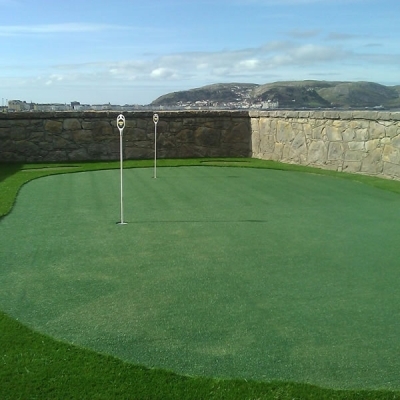 The overall length of this compact version of our Putting Green is 2.9 metres and is 0.4 metres wide. 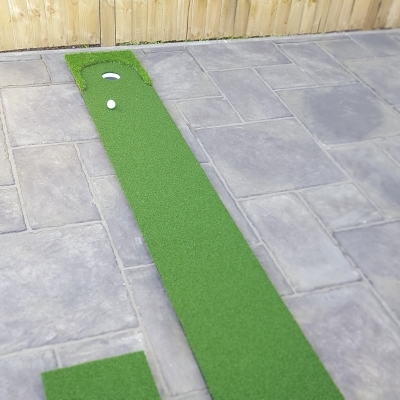 The player stands on a platform by the side of the surface when putting. 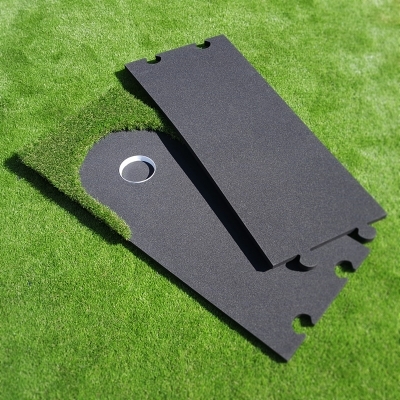 The lightweight base is in 3 sections that join together in a jig-saw manner without the need for any tools. 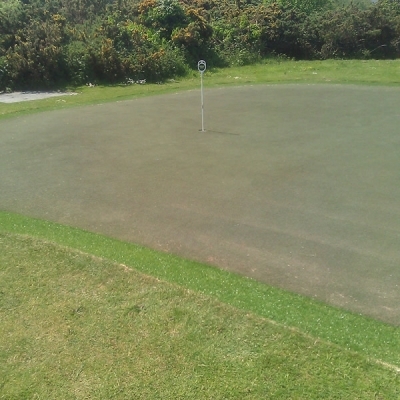 The surface of the Green runs at 10 on the stimp meter providing a realistic roll of the ball. 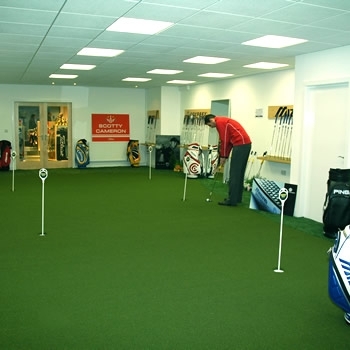 A truly first-class indoor putting surface for coaching, practice or putter assessment at golf centres, teaching academies, pro shops and golf equipment stores. 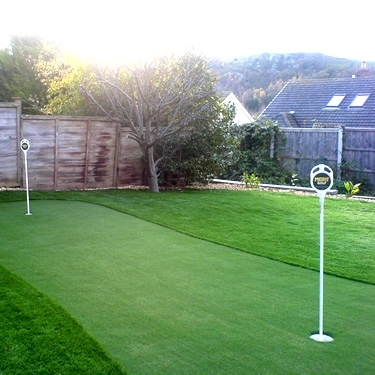 Ball roll and speed mirror that of a tournament-quality natural green - yet at a fraction of the maintenance requirements or cost. 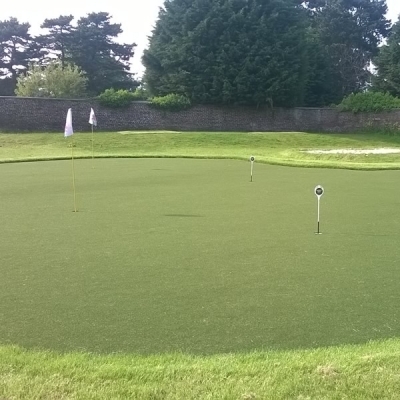 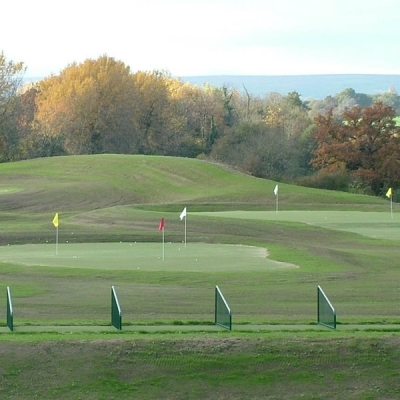 The solid base enables undulations and contours to be incorporated within the putting surface. 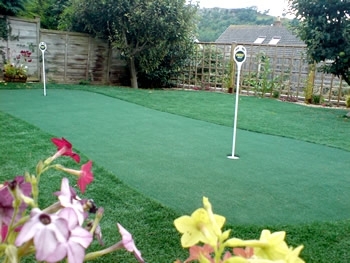 Available in sizes from 5m x 4m upwards. 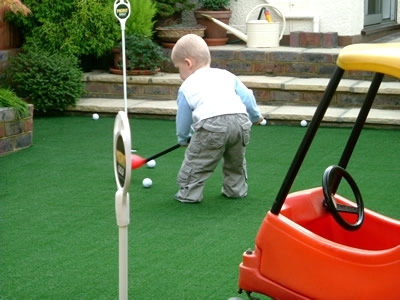 Safe, fun and durable - even for little Tigers! 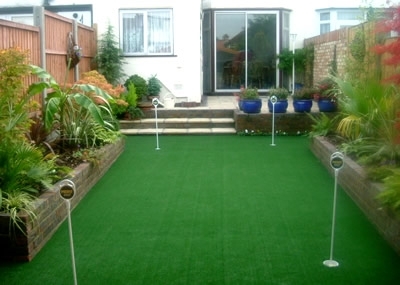 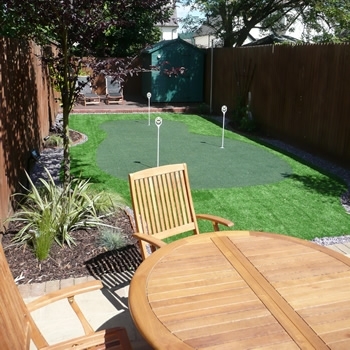 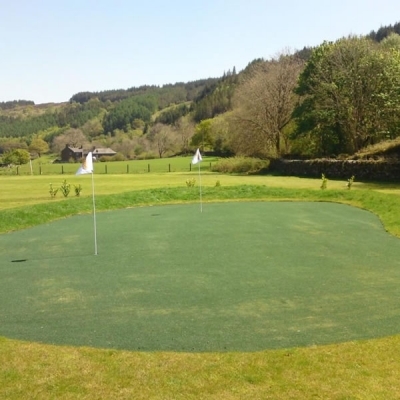 The Garden Leisure Putting Green has been developed as a high quality polyethylene, DIY Easy Install product aimed at the private individual or family who would like a putting green in their garden. 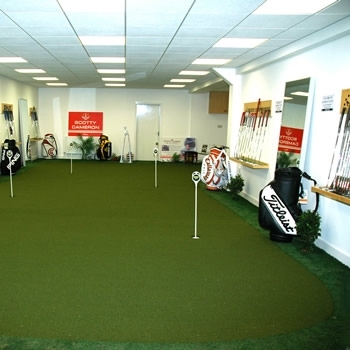 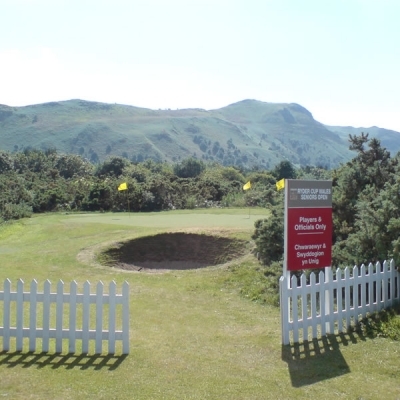 It is intended as a facility for both the serious golfer and all the family for leisure time enjoyment. 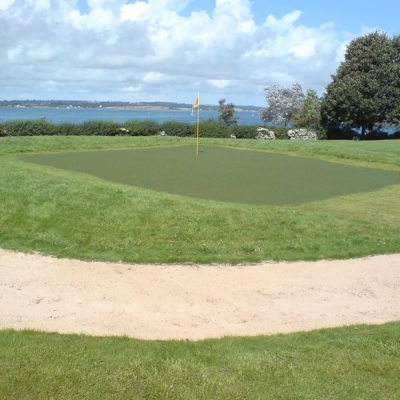 The turf only requires a light dressing of filler sand and has a speed of 9 on the stimp meter. 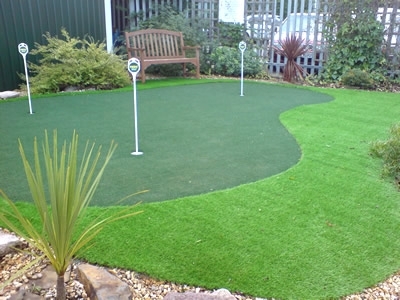 The Garden Leisure Putting Green turf is available in stock 2 metre width roll sizes (4 metre widths by special order). 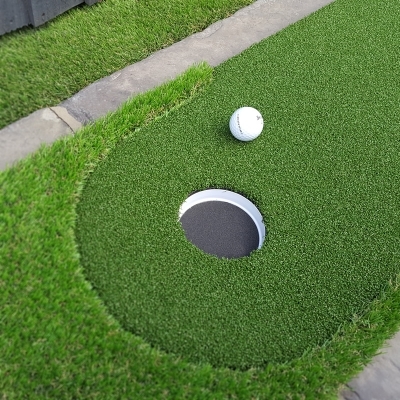 The turf can be easily cut and joined if required. 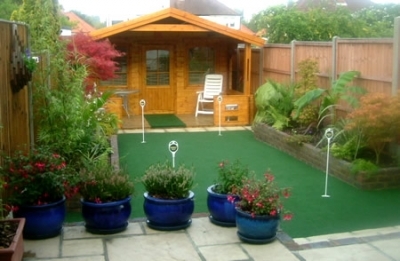 We supply the hole kits, the joining materials and comprehensive installation instructions. 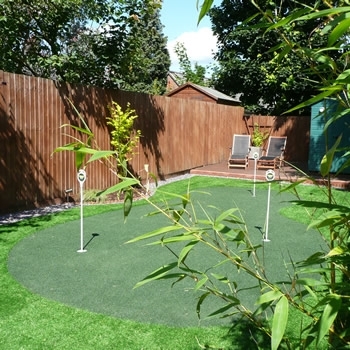 You will also be offered the support of a helpline service. 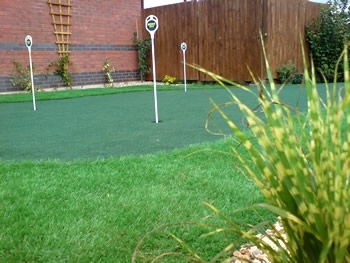 The Garden Leisure Putting Green is also suitable for indoor applications. 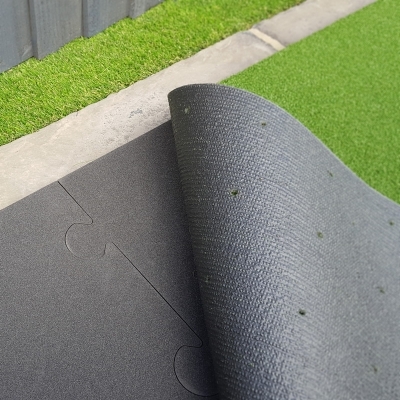 The surface does not require an addition of sand for indoor applications and is therefore suitable for installation on level, wooden floors.